Here is something that confuses a lot of people. What to put in coffee? We were taught dairy was bad, and non-dairy creamer was glorified as “heart healthy”. Guess what? The last five – ten years of research has proven that the OPPOSITE is true. Coffee-mate like beverages are the WORST thing you can put in coffee, and they contribute to obesity and heart disease, among other things. They are full of partially hydrogenated oils/sugars/flavorings/stabilizers and chemicals. THEY ARE POISON. So, what’s better? You’d be surprised. Like Mark Hyman (my physician) has said before “If your grandmother ate it, it is probably ok“. Guess what? Grandma didn’t have “non-dairy coffee creamer”, or flavored high sugar milks/creams. She just had heavy cream from cows who ate grass (their natural diet), and that is what organic grass fed pasture cream is. If you can’t tolerate dairy, try an unsweetened nut milk but please don’t think that you’re being healthy by using a “natural” product. Be smarter than the food giants who want to sell you “frankenfood”: TURN IT AROUND TO REALLY SEE WHAT’S IN IT. If you love vanilla, add a bit of real vanilla extract or vanilla bean, and get a plain milk version. Another trick is to scream low fat or high protein on the front, but not mention the sugar in it. 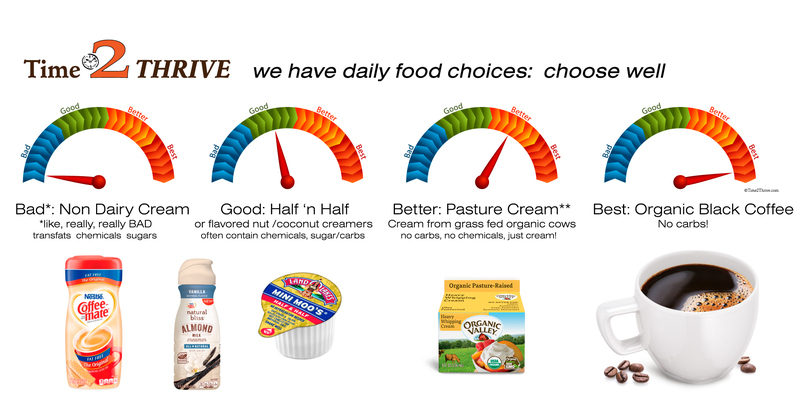 Unsweetened (key word is unsweetened) nut milks are often ok, but watch the carb content. A friend recently gave me some oat milk to try, and it was fabulous, BUT it was a “barista blend”, and had the following ingredients: Oatmilk (water, oats), rapeseed oil, dipotassium phosphate, calcium carbonate, calcium phosphate, sea salt, vitamin B12, riboflavin (B2), vitamin D2, vitamin A. Sound yummy? Not so much. If you can’t pronounce it, and it has more than 2 or 3 ingredients, it probably isn’t NATURAL. STEER CLEAR. On the other hand, unsweetened almond milk is fine, as long as it is almonds and water and not a lot of chemicals (emulsifiers, stabilizers, etc.). It is hard to find them without other ingredients, which is another reason you can make your own, but in the end compare and purchase the one with the fewest additives. I only use a small amount, less than ¼ cup/day. Finally, since we’re talking coffee, you get what you pay for. Be sure you’re buying good beans. Do you know light roast actually has more caffeine than dark roast? It does, but darker roasts may have more antioxidant properties. Finally, if you’re on the bulletproof craze, using grass fed ghee (clarified pasture butter) and MCT oil is great, and there isn’t a bump in your glucose, because, like heavy cream those two add ons have no glycemic load. Read about Bulletproof Coffee here. It works quite well with intermittent fasting. Read my post on intermittent fasting here. Next up: WHY BEEF ISN’T BAD, but what you need to know to eat it and be healthy. Previous PostBad-Better-Best: Is Butter Bad?